About Graphic Image: You know these products. They have been sold for generations in the best stores around the world. Maybe your professor had one, or the lady you noticed writing in her journal at the coffee shop. Made by a family-owned company in Melville, New York, Graphic Image produces the highest quality leather-bound books in the U.S., perhaps the world. But rather than ostentatious logos, Graphic Image’s brand is built on quality materials, painstaking workmanship and simple, yet elegant designs.It starts with great leather. Our collection is made from the finest genuine goatskin leather, which is incredibly durable and will last a lifetime. That’s why priceless books, such as the Gutenberg Bible, are typically bound in goatskin.Our Smyth-sewn binding allows these books to remain open and lay flat. Our paper is an industry secret: the writing surface is smooth, the ink is absorbed quickly, and the pages have the perfect opacity so the writing doesn’t show through. Just write your first sentence and you’ll be hooked.Each book has gilt-edged pages that are not only beautiful, but also serve an important function. When the book is closed the gilding creates an impermeable seal which prevents moisture from seeping in and keeps the pages from yellowing. Additionally, many of our books feature a satin ribbon marker.We are proud to say the majority of our customers are return purchasers. 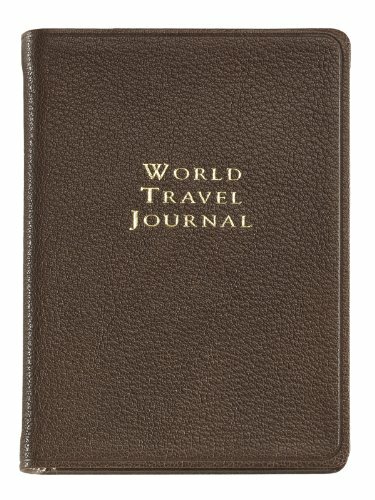 After you have used one of our journals or calendars, you’ll be back too.Product Info: The World Travel Journal includes summary pages for detailing your adventures and full color maps to help you on your way. Editorial information includes toll-free numbers, world weather, travel distances and international dialing codes. Whether you wish to remember the practical details of a business trip or recollect your summer vacation abroad, this is a keepsake for generations to come. 320 pages including information on international currency, capitals, languages and religions, passport and customs information, and a directory of foreign embassies in the U.S.
Best Travel Journal out there I have owned these same Graphic Image travel journals (in different leather bound colors) and was pleased with the quality as well as the functionality of the pages. Having purchased the 11″ Graphic Image Journals in the past, the paper is perfect for fountain pen use with no bleeding through the page or any other ink related issues. A Bit Over the Top This journal has a nice binding and decent paper, but the world maps and extra information are total overkill. It would be a much better product if they replaced the maps and gimmicks with just good old blank pages. The format of the pages are also not very easy to use, with a series of pages meant to have just a bit of a jotting about each place and then jump to a continuation on a blank page later in the book. This is a book for someone who thinks about traveling the world but has little intention to do so. Someone that wants to look at maps of all the places they could go, and may actually go to a place or two and wants to feel like they’ve filled up a volume with lots of insight when really they’ve just filled a few pages spread over this journal. This is not a journal for anyone who really wants to write about their experiences and needs some space to do so.